The agency also won Best Campaign: B2C category and UAE managing director, Ghaleb Zeidan, was named PR Leader of the Year, as well as receiving highly commended awards for their work in the Game Changer and Rising Star of the Year categories. 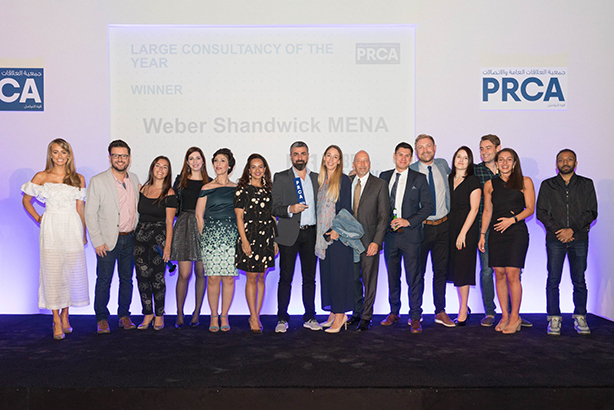 Ziad Hasbani, the regional chief executive officer for Weber Shandwick MENAT, said: "To be recognised by PRCA MENA as Large Consultancy of the Year is a great achievement for all of our teams across MENA. Commenting on his PR Leader of the Year award, Zeidan said: "I am both humbled and honoured to have received the PR Leader of the Year award. I am delighted to acknowledge the effort and support I have received during this time from my friends and colleagues across the UAE, and to thank the senior leaders for entrusting me to deliver their vision." Other big winners were Hill+Knowlton Strategies, which scooped awards for Best PR Campaign: Digital, Best PR Campaign: Game Changer and the Social Impact award. Seven Media took home two awards for Best Regional Campaign for the forthcoming Special Olympics; the first time the event will be staged in the Middle East in its 50-year history, and for Best PR Campaign: Media Relations. Saatchi Public Relations, won the best Best PR Campaign in the B2B category, while Golin MENA won Best PR Campaign in the B2C category. Dubai Multi Commodities Centre (DMCC), copped the gong for Best Integrated Campaign, while Maven Marketing and Events won in the Best PR Campaign for Influencer Relations for its work with former Miss Universe Olivia Culpo and her collaboration with lifestyle event Beauty Pop. Other agencies that won awards were Grayling, BPG ORANGE, Brazen and Ras Al Khaimah Tourism Development Authority (RAKTDA).